Front Row from left to right: Ven. Nyānaponka (Nepal) Ven. K. Piyatissa (Sri Lanka) Ven. Rewata Dhamma (Burma, Birmingham Sayādaw), Ven. 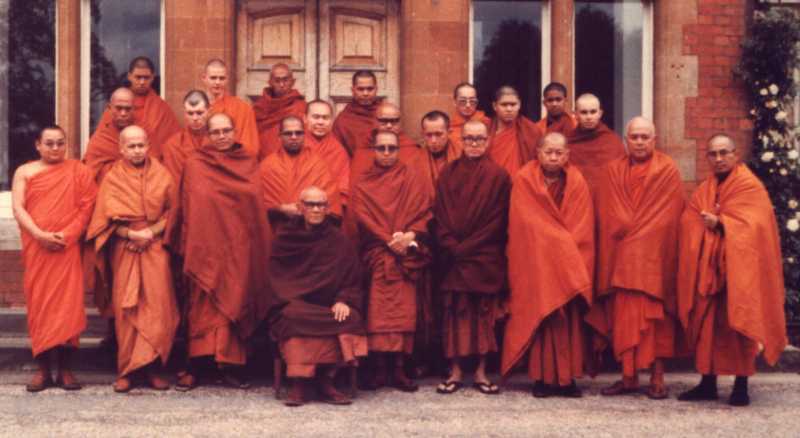 Pemaloka (Sri Lanka), Venerable Mahāsi Sayādaw (seated), Chanmyay Sayādaw U Janaka, U Aggadhamma (Burma, Sayādaw’s attendant), Ñānadharo (Laos), U Myat Saw (Owner of Oakenholt, temporary monk), two temporary monks. Back Row: Temporary monks, and Bhikkhu Pesala.